On the South Shore of Massachusetts, driving up Route 53 (a busy secondary road lined by malls and restaurants), you could easily miss the North River which separates Hanover from Pembroke. It’s not much of a river, but as far as the South Shore goes, it’s about the biggest one around. Closer to the ocean, the river is wide and offers some striking vistas. In the 19th century it was the site of numerous shipyards where hundreds of large sailing vessels were built (some of them famous, but that’s a story for another day). Where Route 53 crosses the river over a small, inconspicuous bridge, the river is narrow and shallow. Go a bit upriver from the bridge and narrows to a stream, easily forded. Every time I cross over that bridge, the same story jumps to mind about two men crossing that stream back when the entire area was wilderness. Modern Route 53 roughly follows the old colonial path from Plymouth to Boston. And I do mean roughly. The modern route deviates far from the old one in many places. But, in some stretches, they are one and the same and it’s interesting to drive along that route and contemplate settlers walking the same path 400 years ago…and Native Americans long before that. In the 17th century, the path led from one colonial capital to another–between Plymouth Colony and Massachusetts Bay Colony–two separate entities until they were merged in 1691. In October of 1632, Gov. 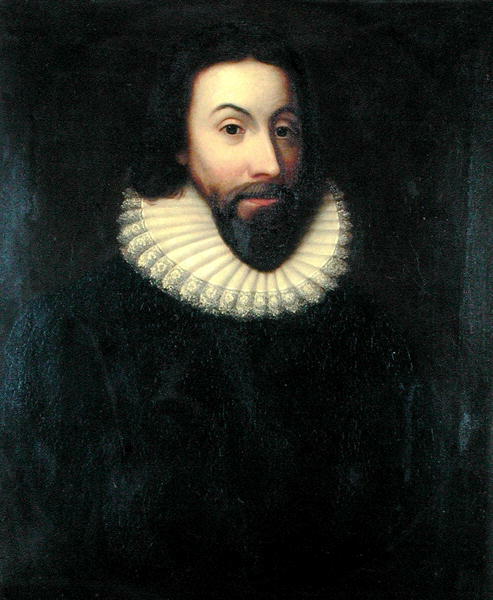 John Winthrop of Massachusetts Bay decided to pay a visit to neighboring Plymouth Colony. Winthrop’s Massachusetts was only two years old. Plymouth had been there for twelve years. Although they pledged to help one another, the two colonies would eventually build up something of a mutual grudge. Plymouth was established first but would quickly be surpassed by its neighbor to the north. Winthrop’s colonists had picked a better harbor and Boston would grow rapidly. The Plymouth settlers, led by Gov. William Bradford, got into some uncomfortable tangles with their Boston counterparts as the two colonies competed over trading posts in what would become Maine and Connecticut. The two colonies also differed somewhat on religion, Plymouth being more tolerant by comparison. The Massachusetts Bay settlers, as historian Nathaniel Philbrick points out in his book Mayflower, were more ambitious, more eager for financial success. The Pilgrims in Plymouth were destined to become the “poor cousins,” so to speak. But this rivalry had yet to evolve in 1632 when Winthrop made his trek from Boston to Plymouth. At that stage, both colonies very much needed each others’ help to survive. Such a journey, in those days, was made either by boat or by foot. There were very few horses in either colony at that time. Winthrop and his small entourage took a boat from Boston to Wessagusset (now Weymouth) and then commenced the 25 mile walk to Plymouth over footpaths that meandered through forests and meadows (a good portion of the route he followed is now Route 53). Despite their differences, the two men seemed to get along. Bradford would later refer to Winthrop in his journal as his “much honored and beloved friend.” After a few days in Plymouth it came time for Winthrop to head back to Boston on October 31, 1632. Bradford accompanied him a few miles in the dark hours before dawn. Then, taking his leave, Bradford headed back towards Plymouth. 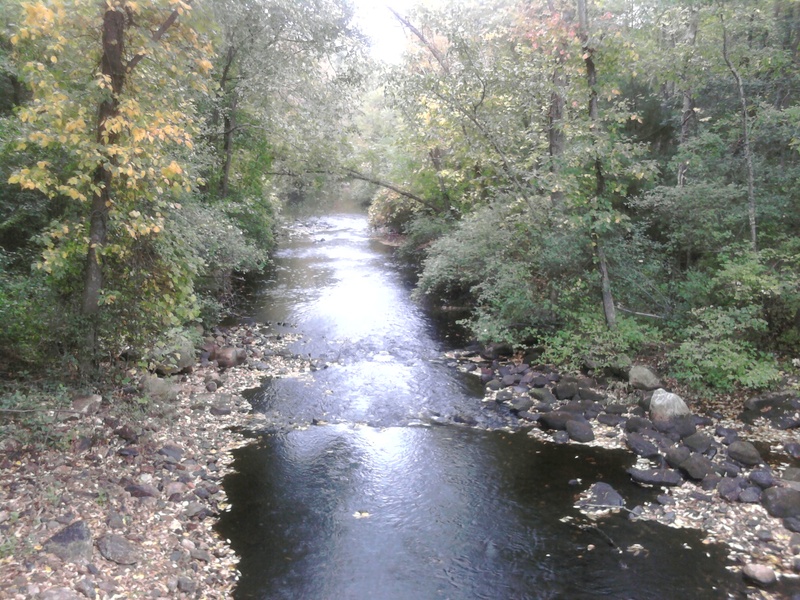 A bit downriver of Luddam’s Ford Park in Hanover, Massachusetts. Here, where it’s more wooded, it’s possible to imagine what the area looked like in 1632. This image has always struck me as funny. It’s not as though Winthrop was at court in London. He’s in the middle of the wilderness. What does it really matter if he gets a little dirty? But, he was a gentleman. Muddy boots and wet breeches apparently would not do for him. So, he made poor Luddam carry him across the river. Not to read into it too much but this little episode says something about his character–or perhaps more about the culture in which he lived. I can only imagine how ludicrous this scene must have looked. Out of gratitude, Winthrop named the spot Luddam’s Ford. The name has stuck to this day. I’ve always known that Luddam’s Ford is quite close to the spot where Route 53 crosses the North River. This is why the image comes to mind every time I drive that way. But I’d never bothered to seek out the exact spot. Having a bit of extra time this morning, I decided to veer off Route 53 and find Luddam’s Ford. I was pleased to find the site marked by a large sign, “Luddam’s Ford Park.” It’s a pleasant place with walking trails and picnic tables. I wondered, as I walked towards the water, how many visitors know how the place got its name. Looking at the river, I tried to ignore the remains of the 19th century mill, the modern road and bridge, and the nearby houses with neat lawns. I tried to imagine it as a forlorn ford in the woods, halfway between two tiny colonies. And Luddam trudging across the rocky riverbed, immersed halfway in black water with a governor on his back. Somehow I doubt Governor Bradford would have consented to be carried across.